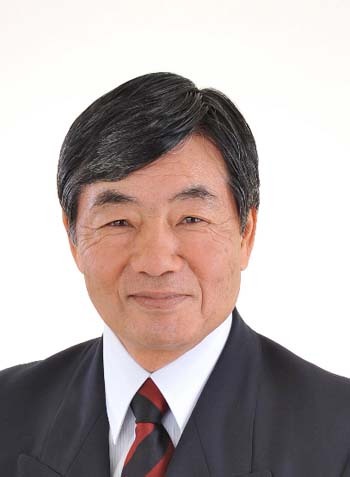 Nago Mayor Susumu Inamine promises to continue his fight against the Henoko plan although his backers lost one seat in the Sunday Nago Assembly election. The ballots for Sunday’s assembly seats election are counted, and the results –at least in Nago City—do not bode well for the plans now under way to relocate Futenma Marine Corps Air Station to northern Okinawa. The Nago City assembly election has drawn national attention as anti-base supporters of incumbent mayor Susumu Inamine captured 14 of the 25 seats up for grabs. It was a loss of one seat, but still leaves parties opposed to relocating Futenma to Camp Schwab and Oura Bay in Nago City’s Henoko district in the majority, and increases worries for both the central government and Governor Hirokazu Nakaima that the protests will increase in numbers and fervor. Of the 35 candidates for the assembly posts, 16 had supported the replacement airfield facility with its twin V-shape runways extending into the Oura Bay. All 337 local assembly seats across Okinawa are confirmed, except for Taketomi Town. With exception of Nago City, voters were somewhat unconcerned about prefecture or national issues, with voter turnout dropping to 60.74%, a drop of 2.5% from the last election in 2010. In the 23 municipalities voting, 235 winners were incumbents, while 91 are new faces at the table. Women scored gains of 26 seats, up to 34. In Nago, the New Komeito party is opposing the Futenma relocation, and held on to its two seats. Over the past four Nago elections, in which Inamine swept into the mayor’s office in 2010, Nago citizens have been opposed to moving Futenma to northern Okinawa, in their back yard. Anti-Inamine candidates campaigned not on the Futenma issue, but instead made stimulating the local economy a priority. They did criticize Inamine’s administration, but it didn’t gain them added support. The vocal opponents were loud, but Nago citizens seemingly weren’t impressed with either side, ducking the polling stations. Only 46,219 eligible voters cast ballots, a record-low turnout of 70.4%. In Okinawa City, 16 ruling party members held on to the majority of the 30 seats. Incumbents kept 19 seats, 10 were first timers, and one was a former assembly member. In Ginowan City, incumbents won 21 of the 26 seats. The ruling party candidates hold more than half of the seats. In Nanjo City, incumbents won reelection, taking 13 of the 20 seats. In Ishigaki City, incumbents claimed16 of the 22 seats, five are new to the assembly, and one is a former member. Norimitsu Miyagi won the Ogimi Village mayoralty race. He served seven terms as a village assembly member. 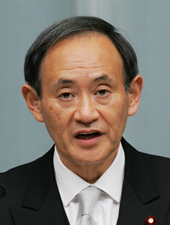 Chief Cabinet Secretary Yoshihide Suga was quick to confirm that Tokyo would do all it can to get the Henoko plan realized. In Tokyo, the central government appeared to be unconcerned by the Nago voters’ action. 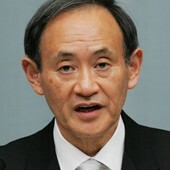 Yoshihide Suga, the Chief Cabinet Secretary, called relocating Futenma to Henoko “the only effective solution” to reducing safety concerns about the Marine base located in the heart of downtown Ginowan. He predicted the local assembly election results will not alter Okinawan opinions heading into the November gubernatorial election, because supporters of the move gained a seat. He says there is no change in the government plans to press forward with the relocation, and the ruling Liberal Democratic Party is backing Nakaima in the upcoming election. Takeshi Onaga, mayor of Naha City and Nakaima’s challenger in the gubernatorial election, is hoping, though, that the assembly results will help his cause on November 16th. He opposes Nakaima’s bid for a third term, and disagrees with the governor’s approving the land reclamation off the Henoko coast late last year. Already, preliminary work is in progress with drilling surveys in Oura Bay. Japan’s new Defense Minister, Akinori Eto, has also weighed in quickly on the controversy, promising the “earliest possible” relocation of MCAS Futenma to Camp Schwab. “We have to avoid keeping Futenma in the center of Ginowan, which is densely packed with houses and schools,” the 58-year-old Eto said at the Defense Ministry. He acknowledged “though we are fully aware of the various opinions among the local public, the only solution is to avoid continuous use of Futenma by relocating it to Camp Schwab”. Asked about the Nago mayor’s position, and the Sunday assembly election results, Eto said “as a Cabinet minister, I prefer not to comment on the results of a local election.” Eto is also the nation’s Security Legislation Minister, a new position created by Prime Minister Shinzo Abe during his cabinet reshuffle little more than a week ago. He is a LDP politician from Aomori Prefecture, and served as parliamentary senior vice defense minister seven years ago.